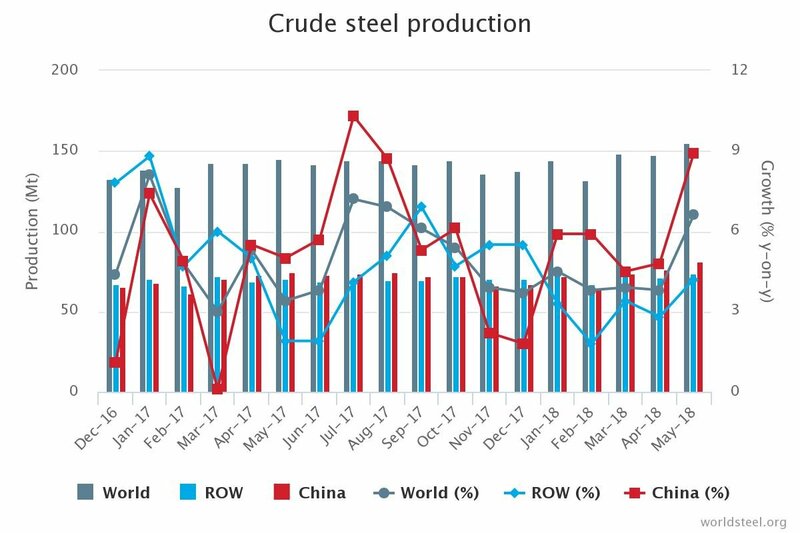 China’s crude steel production for May 2018 was 81.1 Mt, an increase of 8.9% compared to May 2017. Japan produced 9.1 Mt of crude steel in May 2018, up 1.8% on May 2017. India produced 8.8 Mt of crude steel in May 2018, an increase of 7.6% compared to May 2017. South Korea’s crude steel production was 6.2 Mt in May 2018, an increase of 3.0% on May 2017. In the EU, Italy produced 2.2 Mt of crude steel, up by 3.7% on May 2017. Spain produced 1.3 Mt of crude steel, up by 7.0% on May 2017. France produced 1.3 Mt of crude steel, a decrease of 6.5% compared to May 2017. Turkey’s crude steel production for May 2018 was 3.3 Mt, up by 0.5% on May 2017. Crude steel production in Ukraine was 1.7 Mt this month, up 2.9% on May 2017. The US produced 7.1 Mt of crude steel in May 2018, an increase of 3.0% compared to May 2017. Brazil’s crude steel production for May 2018 was 2.7 Mt, down by 8.6% on May 2017. The crude steel capacity utilisation ratio of the 64 countries in May 2018 was 77.7%. This is 4.2 percentage points higher than May 2017. Compared to April 2018, it is 1.0 percentage point higher. 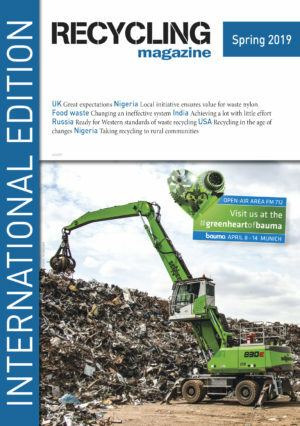 The Institute of Scrap Recycling Industries (ISRI) has recently updated its Scrap Specifications Circular to include new specifications for Flexible Poly Vinyl Chloride (PVC) Plastic scrap. The new specifications were approved at the ISRI Convention Board and Governance Meetings on April 16, 2018. According to the BIR, reports from the Central Committee of the Communist Party of China, published on 24 June 2018, highlight that China plans to reduce its imports of solid waste to zero by the end of 2020.